Protests at the Boston Museum of Fine Arts | Ready, Set, Kimono! La Japonaise by Claude Monet. Image from the Boston Museum of Fine Arts. Over the last week, there has been some controversy in the kimono world. the Museum of Fine Arts in Boston has displayed a painting by Monet called La Japonaise. It’s a painting of his wife wearing a blond wig (to emphasize that she is European) and a kimono (to be specific, an uchikake). It was painted to reflect Europe’s love affair with anything Japanese during that time. This exhibit was made interactive with the help of NHK (Japan’s national broadcasting company). They commissioned and donated an exact replica of the kimono in the paining. It was creating by some of the best artisans in Kyoto who create kimono everyday. The entire exhibit toured Japan with no problems whatsoever. And then the exhibit reached Boston. Until a few days ago, The museum hosted “kimono Wednesdays” when visitors were able the try on the kimono and take a photo with the painting in the background. Some people weren’t very happy with that. People started protesting at the museum. 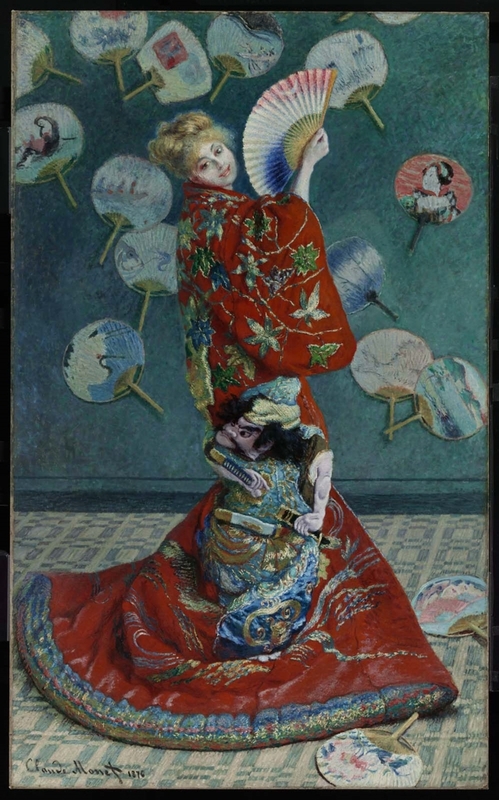 Their message was that non-Japanese people trying on a kimono with no context or background information was racist and reflected the imperialism and orientalism of the French people at the time that La Japonaise was painted. The museum decided to cancel all further “kimono Wednesdays” events and only have the kimono available for visitors to touch, not to try on. The Boston Globe has also written a good summary of the events that happened and I recommend reading it. Here’s what I think about the whole situation. 1) I spent a lot of time looking at their facebook page last night (although it appears to have been deleted by this morning), trying to get to the root of their argument. I honestly couldn’t. And I tried. I was up past midnight trying to understand. One commenter in the same state of confusion asked “what should I stand up against?” and couldn’t get a straight answer. The summary of their argument that I wrote above is the best interpretation that I can give, based on what I read. I also read comments from protesters indicating that they objected just to the presence of the kimono, people taking selfies in the kimono, and a lack of information on the kimono. Essentially, they couldn’t articulate their argument and convince me why I should be standing up against this. 2) The main protesters identified themselves as Asian-American. Not Japanese. Not Japanese-American. Just Asian-American. They pointed out that their protest had nothing to do with Japanese people living in Japan. It was focused on Asian-Americans living in the USA. Does a person with Thai, Chinese, Korean, Malaysian, Cambodian, or any other Asian heritage get to decide how a Japanese company (NHK) chooses to represent their culture overseas? I thought the politically correct thing to do was to identify people by the specific heritage of their family (Japanese-American, Chinese-American, Korean-American, Vietnamese-American etc.) instead of clumping everyone together into a general Asian-American group. If it’s unacceptable to greet a Vietmanese-American with “konichiwa” then why is it acceptable for a Vietnamese-American (or someone from another group) to decide that a kimono worn by a non-Japanese is racist? I identify as Dutch-Canadian. I would never dream of telling my Dutch friends (born and raised in The Netherlands) or a Dutch company that the way they choose to share their culture in another country is racist. In fact, it would probably make me re-examine my own beliefs. If something like wooden shoes is not considered racist by people from The Netherlands, then why should I? Here is another reaction to all this from a Japanese youtuber, Rachel and Jun. As I’ve stated previously, I’m not Japanese. Yet I practice kitsuke and I have a license to teach it. So where do I stand on this? Kimono and kitsuke is a dying art. Literally. Most of the artisans who create kimono are well past retirement age and are dying without a successor. there is not a high demand for new kimono (due to their high cost) and most young people have no desire to learn the craft of designing, dyeing, weaving, or sewing kimono. Most Japanese people don’t even know how to dress in a kimono themselves. The kimono has been relegated to a costume within it’s own culture. Most people will only wear a kimono for shichi-go-san (a celebration for three-year-old and seven-year-old girls and five-year-old boys), seijinshiki (coming of age ceremony for twenty-year-olds), or a wedding. Even then, they are usually dressed by a professional. The days of wearing kimono as an everyday garment are over. My hope as a kimono teacher is that I can generate interest in kimono overseas, make it accessible, help create a demand for it, and maybe, just maybe, the crafts and skills involved in making kimono will last a few generations more. I am doing this with the full support and knowledge of my teachers in Japan. I am not trying to be Japanese. I am trying to preserve a small part of a culture that is not my own, but that I love and cherish, and does not have a large following in it’s country of origin. It hasn’t happened yet, but I know, sometime in the future (maybe incredibly soon with this post), someone will accuse me of cultural appropriation. I’ve seen their arguments on many different websites. They will dismiss whatever I say because I am white. Because I have privilege. I don’t deny either of these things. I know it exists. It’s in the back of my mind every time I put on a kimono, teach a class, or write a blog post. In a world where Japanese people in Japan and around the world have lost the knowledge of kitsuke that was common even two generations ago, where very few people have an interest in learning the art of kitsuke, where the artisans who create these garments are passing away without successors, I have two questions for people who think what I’m doing is cultural appropriation. What are you doing to preserve kimono and kitsuke? What are you doing to keep it alive for future generations? I guess I’ll see what their answer is. I’ve also slowly realised that their own arguments can be turned against them in regards to the accusation of ‘privilege’ because as it appears that Japanese people from Japan have got no problems with this issue, it is the so-called ‘Asian-Americans’ who seem to have appropriated Japanese peoples’ supposed feelings on the issue by assuming an offence has occurred and so they more or less are committing an act of privilege themselves in assuming to speak for the Japanese people as a whole and taking offence on their behalf. Rather bizarre but this has happened before for other things when a certain group of people claiming to have moral and just jurisdiction over another certain group of people and try and ‘act on their behalf’ (as if the people they think they are claiming to represent can’t act themselves) in taking offence over something which the people they think would take offence over it have absolutely no problems at all. The protesters make it very clear that this protest has nothing to do with Japanese people living in Japan. They have distanced themselves from the culture that they accuse others of appropriating. So just how different is the culture of a Japanese person living in Japan and a person of Japanese ancestry who was born and raised in America? I’m guessing pretty different. If somebody wants to accuse me of cultural appropriation, then I had better be appropriating something from their Japanese/American culture. I wonder how many Japanese/American wear kimono on a regular basis? If they do, great. We can have a dialogue on the rules, customs, and appropriateness of wearing kimono in different situations. If not, can you really claim it as a part of your culture? Or would it be a part of your heritage? The redhead in kimono is a very interesting variant on kimono style. It’s a shame to be so consumed with protecting our culture that we’re not willing to share what makes us different. And as in many aspects of our lives, it’s a shame we’re so easily offended. As a lover of fabric, textiles, costumes and history I’m sadden that MFA pulled the exhibit. I feel with the reaction from the protesters other museums when presented with a similar opportunity will decline. I also found that this exhibit was initially staged in Japan and was commissioned by HNK a Japanese company who knew that the kimono would be worn and tried on by westerners. The kimono itself was created for the express purpose to try on. I mean that the MFA pulled Kimono Wednesday where people could try it on. And with my collection rapidly growing I’m keen to encourage my friends to try it and to connect with other lovers of kimono and all it entails. I would really love to participate in a tea ceremony for example. I am also very interested in the fact that you are licensed to perform kitsuke. I live in Australia and am interested in perhaps perusing this further. Certainly no one else I know of in my area is offering classes in kitsuke and I could see that there may be some interest in this. I would truly appreciate if you could provide any links that may be a place for me to start looking into this. I would be mortified if I unknowingly offered any offense to the profession.